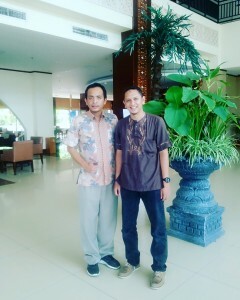 I’m fortunate to meet him again (reunion), not in Jakarta but at my hometown (Aceh). Prof. Widodo Budiharto is one of the youngest Full Professor in Indonesia. My former teacher, tutor and colleague. One lesson learned; stick to the target (he often set his account name with “Prof.” from a decade ago, e.g., email account, yahoo messenger, etc.). Now, he made it ^^.